Today Microsoft has ended support for Windows XP and Microsoft Office 2003. As of today, there will no longer be any public security updates released by Microsoft for either program. We urge customers currently running Windows XP or Microsoft Office 2003 to contact Compare Computers L.L.C. for an upgrade to a supported version or for a new PC running Windows 7 or Windows 8.1. On April 8th 2014, Microsoft will be ending support for Windows XP and Microsoft Office 2003. There will no longer be any security updates released by Microsoft for either program. We urge customers currently running Windows XP or Microsoft Office 2003 to contact Compare Computers L.L.C. for an upgrade to a supported version or for a new PC running Windows 7 or Windows 8.1. Over the last six months, we have seen an increase in malware that encrypts user documents, pictures, and other files - making them inaccessible. This type of malware typically prompts customers to pay hundreds of dollars to decrypt the files within several days or the key to decrypt them will be deleted. We recommend that customers never provide credit card information to any malware program or site. Due to the encryption used, it may not be possible to decrypt the files on the hard drive - which emphasizes the importance of regular backups to external media. Be sure to also disconnect your backup device from your PC when not in use. 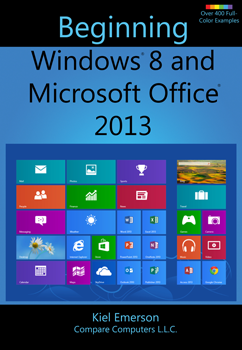 Beginning Windows 8 and Microsoft Office 2013 - Now Available! Compare Computers L.L.C. is proud to announce that our new book Beginning Windows 8 and Microsoft Office 2013 by Kiel Emerson, co-owner of Compare Computers L.L.C., is now available. Beginning Windows 7 and Microsoft Office 2010 - Now Available! Compare Computers L.L.C. 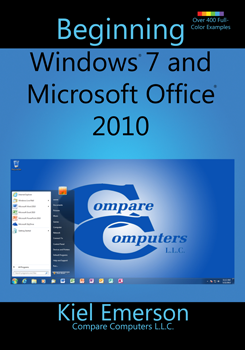 is proud to announce that our new book Beginning Windows 7 and Microsoft Office 2010 by Kiel Emerson, co-owner of Compare Computers L.L.C., is now available. Adobe has released a security bulletin and an emergency Flash update to patch two critical vulnerabilities that are actively being used to exploit Windows and OS X users. The Windows users are being targeted with malicious Flash code embedded in Microsoft Word attachments received via email, while Apple OS X users are being targeted by malicious Flash content hosted online. Starting today, Microsoft Office 2013 is now available. Office 2013 offers a touch-friendly design, with built-in SkyDrive cloud storage capabilities. Office 2013 is only available for computers running Windows 7 or Windows 8. 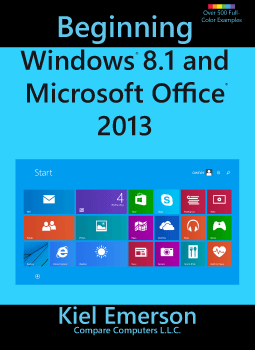 For more details, or to purchase Office 2013, contact Compare Computers L.L.C. for more information. Microsoft Office 2013 has been finalized and released to manufacturing, with general availability starting in the first quarter of 2013. Office 2013 offers a touch-friendly design, ideal for use with Windows 8. Windows Server 2012 Essentials, the successor to Windows Small Business Server, has been finalized and released to manufacturing. This server operating system is geared toward small businesses looking to simplify managing small network related tasks. Server 2012 Essentials will be available for purchase after November 1st. Ahead of Windows 8's public release on October 26th, Microsoft has released a large cumulative performance update for the OS. This update will improve power efficiency and battery life, improve performance, and improve application and driver compatibility with Windows 8. Windows 8 has officially hit RTM, which means the OS is now complete and is on its way to OEMs. Developers will be able to download the OS starting August 15th, with general availability for everyone starting October 26th. Contact Compare Computers L.L.C. for more information on the new OS, and for pricing and upgrade options upon release. Ten years ago today, Microsoft released Windows XP to manufacturing. The release was the first of the consumer operating systems to be based on the NT kernel, which had previously powered Windows 2000 Professional and earlier business operating systems. Over the last 10 years, Windows XP gained massive market share, and has continued to be a stable OS for many businesses and individuals. Microsoft has ended support for Service Pack 1 on Windows Vista on July 12th, 2011. Customers still running Service Pack 1 are urged to install Service Pack 2 for free through Microsoft Update, or to upgrade their operating system to Windows 7. Please contact Compare Computers L.L.C. if you need assistance installing Service Pack 2, or if you would like to upgrade to Windows 7. After nearly 10 years since its release, Microsoft will be ending support for Microsoft Office XP on July 11th, 2011. Microsoft is discontinuing all public fixes and automatic "Patch Tuesday" updates for Office XP. Customers with the software currently installed will still be able to continue using the programs. However, we recommend updating to a currently supported version of Office, since security updates and patches will no longer be available. Please contact Compare Computers L.L.C. to purchase the newest version of Microsoft Office, Office 2010. Today Microsoft officially launched Office 365 - its cloud-based office productivity suite. Office 365 offers subscription-based access to Microsoft Office, SharePoint Online, Exchange Online and Lync Online. Find out more here. Microsoft has announced general availability of Service Pack 1 for Microsoft Windows 7 and Server 2008 R2 beginning February 22nd. At that time, SP1 will be available through Microsoft Update or through the Microsoft Download Center. Our technicians are available for customers needing support installing the update package on their PC.